Four brand new stories featuring the investigators of infernal incidents, in one box set: 1. JAGO AND SON by Nigel Fairs. 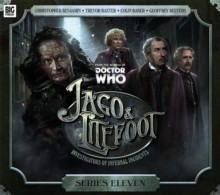 With missing persons, dead bodies and a Satanist cult to deal with, both Litefoot and Jago need help. Professor Litefoot finds himself working with Jean Bazemore, an old archaeologist friend. Jago, however, finds he is assisted by someone he never even knew existed - his own son. Or is he? Can Jago be sure of anything? But there is more to events than the detectives know. An alien menace is stirring underground. Once again, Jago and Litefoot find themselves fighting for their lives...2. MAURICE by Matthew Sweet. As he tightens his grip on Inspector Quick, the Master becomes interested in the young composer Maurice Ravel. For his part, Ravel befriends Professor Litefoot. But is anyone truly who they seem or able to control their own destiny and actions? When Litefoot goes missing, it's up to Jago to investigate. But the Professor finds himself in a nightmare landscape where reality and fiction seem to have merged. Will he ever manage to escape? And if the real Maurice Ravel is trapped with Litefoot, who exactly is walking the streets of London? 3. THE WOMAN IN WHITE by Simon Barnard and Paul Morris. The great actor Henry Irving is not as great as he once was. In fact, he's awful - a shadow of his former self. Worried that something may be terribly wrong, Irving's assistant Bram Stoker enlists the help of an old friend - Henry Gordon Jago. With Irving's state deteriorating, Professor Litefoot also faces a challenge. He performs an autopsy on a man who has had all his bodily fluids drained from him. Can the detectives discover the connection between the great actor and the mysterious dehydrated corpse? And how does it relate to the Woman in White who supposedly haunts Irving's theatre? 4. MASTERPIECE by Justin Richards. 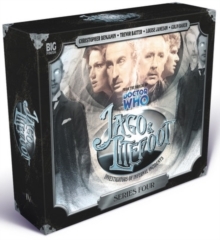 The Master's plan is nearing completion - and he is sure that Jago and Litefoot will help him bring it to fruition. With Inspector Quick increasingly under the Master's influence, the Infernal Investigators find themselves tired and fatigued, as if their very life force is being drained away...With the help of Ellie together with stage hypnotist Madame Sosostris and her assistant Mr Nocturne, Jago and Litefoot finally track down the Master. But as they make their way towards his lair, the Time Lord's true scheme is revealed. 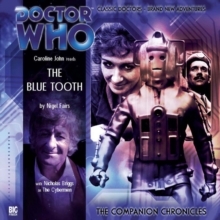 This is the eleventh of an incredibly popular audio spin-off series of two Doctor Who characters first encountered in hit story The Talons of Weng-Chiang in 1977. The characters were created by Robert Holmes, widely regarded as the best writer to work on the series. Actor Christopher Benjamin is a widely known face on British TV, appearing in everything from The Avengers to Inspector Morse, Poldark to Midsomer Murders. One of the people behind the series - writer and script editor Justin Richards - is the creator of The Invisible Detective series of children's novels. This special volume includes guest appearances from the Doctor (Colin Baker) and his arch-nemesis the Master (Geoffrey Beevers). CAST: Trevor Baxter (Professor George Litefoot), Christopher Benjamin (Henry Gordon Jago), Conrad Asquith (Inspector Quick), Lisa Bowerman (Ellie), Geoffrey Beevers (The Master), James Joyce (Henry Gordon Jago Jr), Rowena Cooper (Jean Bazemore), Andy McKeane (Maurice Ravel), Jonathan Forbes (Bram Stoker), Edward de Souza (Sir Henry Irving), Robbie Stevens (Mr Manners), Maggie Ollerenshaw (Dame Wilhelmina Gussett), Rachel Atkins (Madame Sosotris/Bishop) and Colin Baker as The Doctor.